Prairie City had an unusual start. It was founded in 1855 after an argument between Dr. William Graham and Henry Barricklow. The town was also founded by I.F. Greene and Salmon Prouty, who operated the first printing press in Kansas. The printing press was brought to Kansas by Jotham Meeker to use at the Shawnee Mission and then at the Ottawa Mission. The press was sold to Prouty. It is said James Lane was also a town founder but the extent of his influence is not recorded. A post office was established in 1856, a Catholic church was started in a stone church on top of Liberty Hill and the Protestant Episcopal Church was planning on starting the Heber Institute. The Heber Institute failed before it started and plans for it to be a Boy's School also fell through. The building was then used for the Prairie City School District. A park was established in the center of town called Eden Park and Prairie City was considered the "Italy of Kansas". For awhile, Prairie City and Palmyra were competitors. Palmyra was on the Santa Fe Trail but John Brown stayed in Prairie City the night before the Battle of Black Jack in 1856 and Horace Greeley was visiting Prairie City when he coined the phrase "Go west, young man" which solidified Prairie City's place in history. However, in 1858, when Baker University was founded just south of Palmyra, Prairie City's fate was sealed. But Prairie City continued to grow, becoming incorporated in 1859 and at its peak had three stores and three hotels. Baldwin City was founded in 1860 with Baker University centered in the middle. Palmyra was annexed to Baldwin and Prairie City and Baldwin City lived a peaceful coexistence. 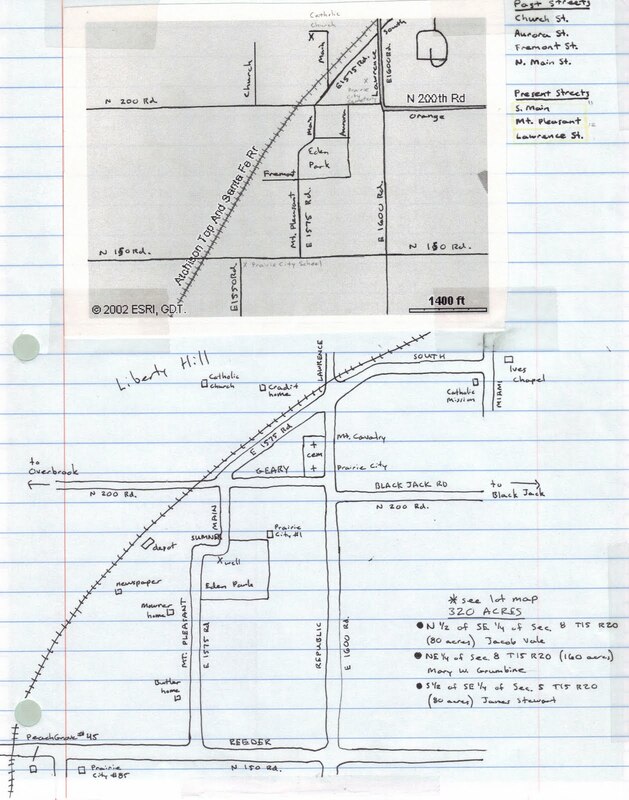 When the Leavenworth, Lawrence and Galveston (LLG) Railroad was built through the area, a depot was built in Baldwin and Prairie City, with stops at both. Thinking that was impractical, both depots were closed and a new one was built in between and named "Media". Media was later annexed to Baldwin City as "West" Baldwin. Prairie City continued to be a small community until March 24, 1883 when the Douglas County Commissioners ordered certain alleys and streets vacated. The only remnants of Prairie City are a few older houses, the ruins of the Catholic Mission, which was closed in 1893 and replaced by a frame structure still standing at the corner of South and Miami Streets in Baldwin, the Prairie City-Mt. 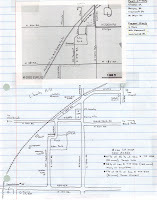 Cavalry Cemeteries and the LLG Railroad which is now used for the Midland Railway. One of the houses still standing is a house on the southwest slope of Liberty Hill. 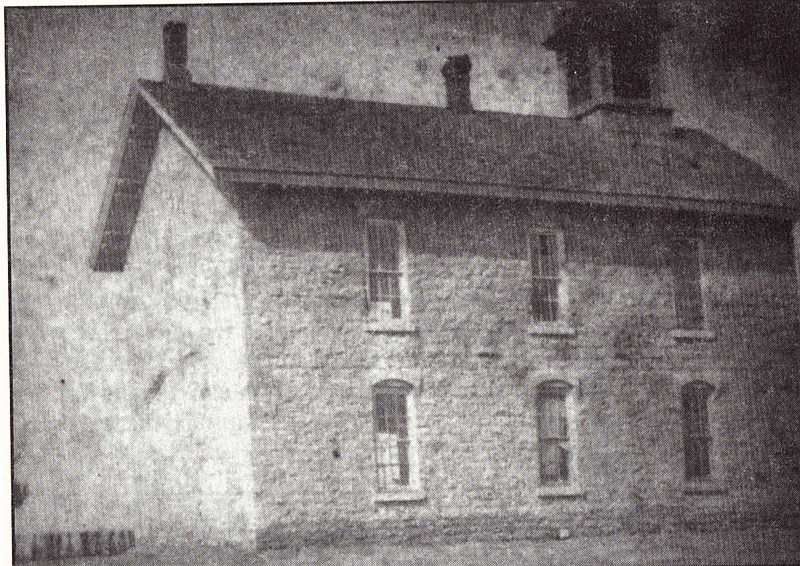 It was built by George Miller in 1860 when he and his family came to Prairie City. The house was named "87" by local teenagers who had trespassed on the property to look at the house and view the two graves located on the southwest of the house. The graves are of George X. and Ignace Meunier. George X. died in 1865 at the age of 1 and Ignace died in 1872, on the day of his first birthday. George was born in 1832 in St. Lawrence County, New York and came to Kansas in 1858, settling in Lecompton. It was there he met Margret Lowery and they got married in February of 1859 and their first child, Adela was born in 1860. George and Margret would go on to have eight more children. George was a stonemason who farmed on 250 acres of land. He would pass away in 1909, with Margret following in 1925. They are both buried in Prairie City Cemetery along with two of their children Julia (1866-1955) and Robert (1874-1949). The Miller plot is marked by a giant stone family marker, probably made by George himself. The house has been abandoned since at least the 1970s. It's still in decent shape however it is estimated it would cost roughly one million dollars to make livable again. I have been to the house several times, and my most recent time, I specifically went to get pictures. I took pictures of every room and tried to get as much of the essence of the house and I am sure I missed some of it but I need to go back soon. I originally found out about the house when on a ghost-hunting kick with my friends. We would go out to the house, wander around and speculate around how the children died. When I found the graves listed in the Complete Tombstone Census of Douglas County, Kansas it just said the children died due to the harsh Kansas living. I tend to believe that and don't think there was actually anything wrong with the children. After visiting a couple of times I became interested in what the history of the house and the family was. I am still doing research on the family but I think I have done all I can with the history of the house. The dilemma I am finding with the history of Prairie City is that it is hard to see if you are not looking. There used to be signs noting Prairie City along East 1575 Road, the Catholic Church Ruins along North 200 Road and the Heber Institute at the intersection of North 200 and East 1575. None of those signs remain and the last one standing is along the railroad tracks and points out the location of the Prairie City store, depot and post office. I was lucky enough to get a picture of the Prairie City-Heber Institute sign but the other signs are now lost. Another abandoned house near the Miller House. Prairie City Cemetery is also a good reminder that the town used to exist but it is a quarter mile east of the townsite and some people may not know that a cemetery may exist. I plan on working this summer on getting donations to erect a new sign telling the history of Prairie City and showing a map marking the location of houses, stores, hotels and past streets of Prairie City. I feel that with all the history surrounding Baldwin City with the Battle of Black Jack, Baker University, Signal Oak and Hickory Point, Prairie City is one area that is getting lost in the shuffle. After I talk to the people at the Douglas County Santa Fe Trail Historical Society and other appropriate entities I hope I can get this going and help honor the people of Prairie City. I will let you know donation details when I am able to.